I buy my bait at the local Grand Asia Market. Their seafood counter is impressive with fish and shellfish from all over the place but they usually have good prices on squid and a variety of fish I have not seen in a while. 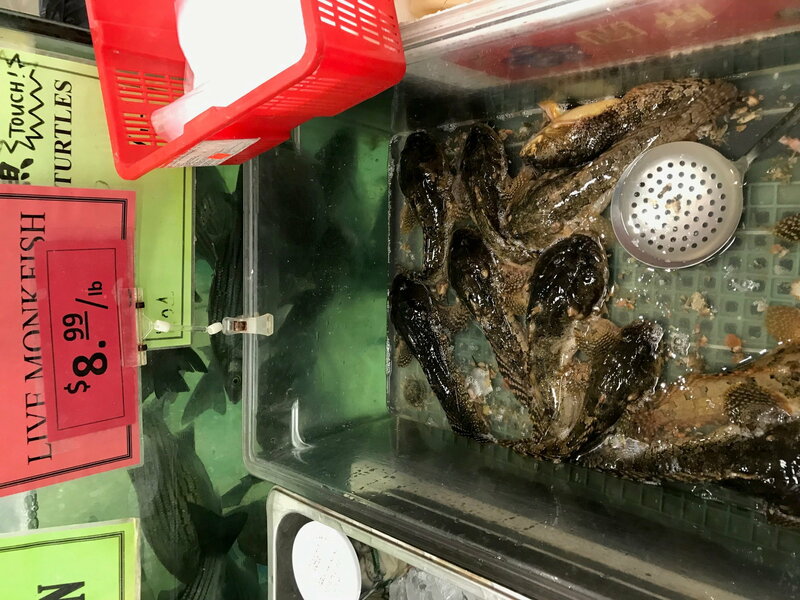 So I stopped in yesterday to stock up on squid and saw a sign for live "monkfish", $8.99 / lb. I have never seen oyster toads (aka.. hackleheads) being sold anywhere before. bigjohnnc and pooleman like this. So what are the regs on possession of live stripers in a fish house? They really aren't bad and real easy to clean... I cooked some up last summer. I have been eating blowfish for over 40 years, they are fantastic. Last edited by Squid Row; 02-27-2019 at 06:54 AM. A long time ago (~50 yrs)while cod fishing we would catch “trashfish” most folks referred to as All-mouth. Some were quite large. Nobody would dare eat them. 10-15 years went by and I start seeing Monkfish on restaurant menus. Actually a type of Angler fish. Turns out they were our old trashfish, the All-mouth. Similar story for Blowfish in southern waters. Now we are seeing more folks trying things like Oyster Crackers and Sea Robins. Such is life. Back to the original topic. Mis-identification of fish in markets and restaurants is definitely a problem that should be addressed. Cleaned and Packaged product is very risky. Beware the counterfeit known as Escolar. Last edited by Stillsearchin; 02-25-2019 at 03:25 PM. we have a thread 'organic food vs. pesticide laden, low nutrition, conventional food' as the main base. Do we want to discuss here 'safe fish to eat vs. pesticide laden, Mercury laden, bacteria laden, farm raised, pelagic, and bottom feeders, and bacteria filtering oysters, low nutrition. and other shellfish contamination'?? My kids who won't eat anything will eat blow fish. Have starting to hear more about people eating cow nose rays as well. From what everyone has said they are supposed to be pretty good. I think the Blowfish secret is pretty much out. Most people know they are excellent! I have heard the same thing. I almost tried it last summer, maybe this one coming up I get around to it. Well right here in this one thread I believe we've had the same fish referred to as "oyster cracker," "oyster toad" and "all-mouth." No wonder there's confusion and mislabeling. And yes, I always thought those were a trash fish growing up back east. Who knew they were a delicacy! It's all Andrew Zimmern's fault! Late Again Grady, rickpcfl and swfishing777 like this.